Every month in both Wood News Online and The Highland Woodturner, we feature YOU, our customers and readers who submit their photos and woodworking stories, which we then publish in our monthly publications. If you are interested in submitting, SEND US AN EMAIL with photos of your shop and/or woodworking, turning, or carving! Show Us Your Shop: Robert Schweiger- Robert used to have his shop in Atlanta before retiring and moving to Satellite Beach, Florida. Once in Florida, he set up his new “retirement shop”, which was downsized from 2500 square feet in Atlanta to 850 square feet in Florida on the second floor of his house. 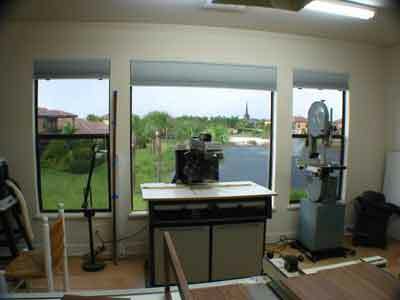 Luckily, Robert has a vertical closet in his shop, in which he is able to store most of his machinery including a scroll saw, Tormek grinder, mortising machine, oscillating sander and bench grinder. He also gets a good workout when bringing in lumber and taking finished projects out of the house. Many of Robert’s projects are made for his church including a serving cart, step-stools, flower stands, and a beautiful oak table that holds bibles and bulletins. View from the Retirement Shop. 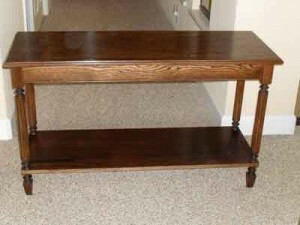 Show Us Your Woodworking: Thomas E. Jones- Thomas is a very inspired woodworker who has drawn inspiration from many different sources including first and foremost, his father, as well as his local woodworking club and all of the woodworking magazines, books, and now internet videos and TV shows. 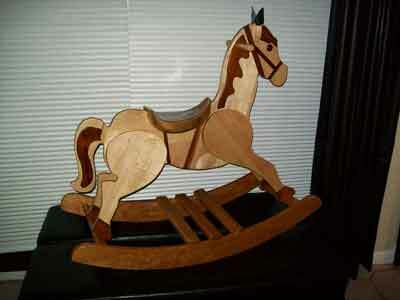 Thomas’s first major project was a rocking horse made of maple, wallba, and cherry. Most recently, Thomas has been working on an urn project for indigent veterans after hearing how some of these veterans bodies have been found buried in cardboard boxes. 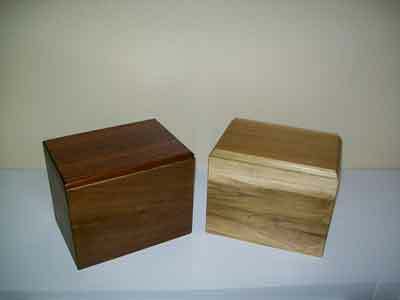 Urns for the indigent Veterans. 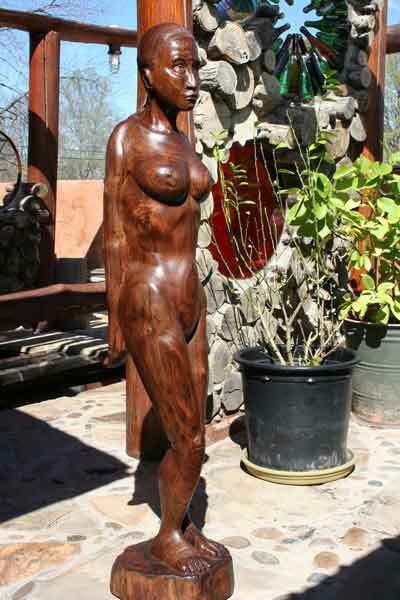 Show Us Your Woodcarving: Shar Troost- Shar is a painter turned woodcarver who is self-taught, mostly from woodcarvers found online. 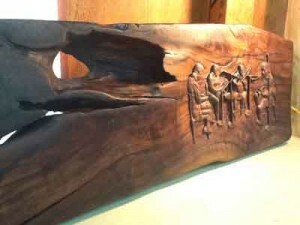 While it is difficult for her to carve due to arthritis, she is still able to work the tools and spent a year on a beautiful piece of 100 year-old walnut to create a music relief. 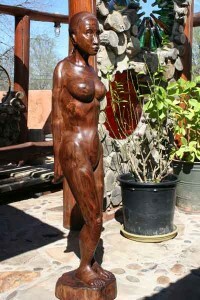 Shar has also ventured into carving human reliefs, where her human anatomy training at The American Academy of Art in Chicago came in handy. Relief carved in an old beam made of walnut. The piece is abut 5″x2″x3″, or there about. 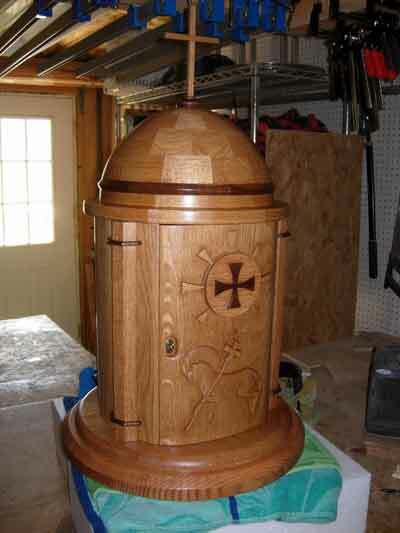 Show Us Your Woodturning: Lawrence Wroten- Lawrence has been a woodworker for over 20 years and although he tends to find faults in his work and doesn’t enjoy building things for himself, he has created a lot of projects for others as well as his church. He has just recently become a woodturner and one of his first major projects was turning a tabernacle, which forced him to use nearly every single tool that he owned. This project incorporated a lot of woodworking and turning techniques, including the creation of a segmented bowl for the dome of the tabernacle. Fridays on the Highland Woodworking Blog are dedicated to #FollowFriday, where we use this space to further highlight a woodworker or turner who we have featured in our monthly e-publications Wood News and The Highland Woodturner. Would you like for your shop or woodworking to appear in our publications? We invite you to SEND US PHOTOS of your shop or work along with captions and a brief history and description of your woodworking (Email photos at 800×600 resolution.) Receive a $50 store credit redeemable towards merchandise if we show your shop in a future issue.